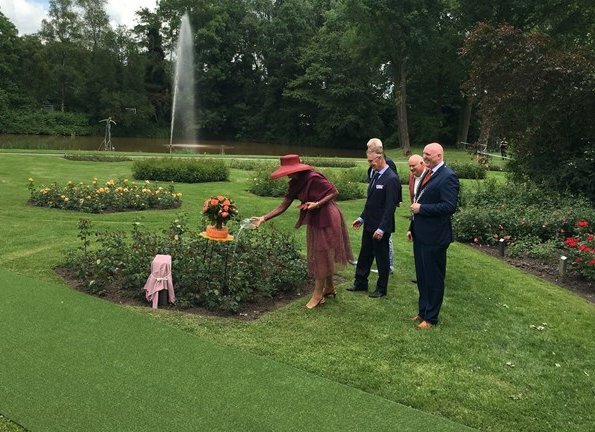 Queen Maxima presents a new rose during the Dutch Rose Association's National Symposium in the Rosarium on June 13, 2017 in Winschoten, The Netherlands. 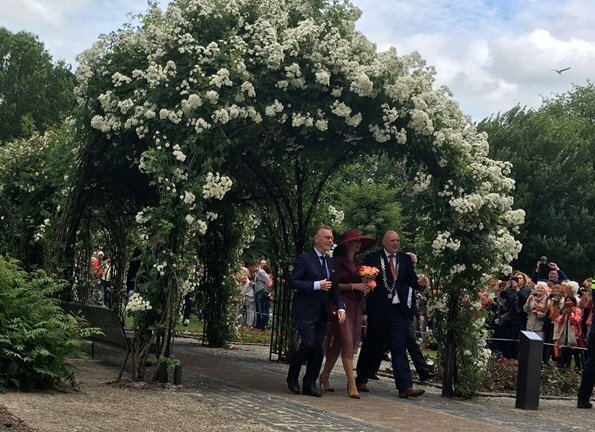 The rose was developed in honor of the 50th anniversary of the Rosarium and the Year of the Rose declared by the municipality of Oldambt. I also think the dress is a bit too sheer at the bottom, but it's a lovely colour and suits her. I love that hat! And it does hide her hair! La reine cache son visage,sescheveux maisvmontre ses genoux en transparence...drôle de choix ! 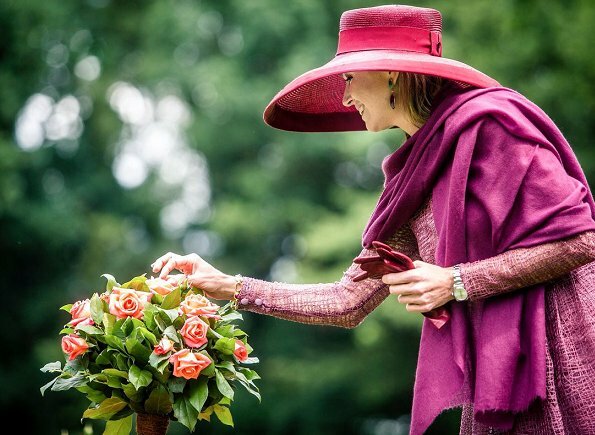 I absolutely love the top part, the color, this hat! !, she looks like a Diva, who could wear a hat like this?? Nobody than Maxima!! the Pashmina Shawl, the smile!! The bottom part is a shere desaster. True, Beth! Don't forget the beautiful roses - all like a painting... The hat is a great solution until she runs finally to the hairdresser ;) But the skirt? Tsss.... It looks so fragile, that part of the dress, just if a young, unexperienced seamstress tried to fix it on the top with helpless hands. - BUT: Picture 5 is wonderful! It needs a frame. Hate a bit too big. But what a lovely womab she is. A bit to big? Any bigger and she'd fly away. I remember how Grace Kelly was criticised when she arrived in Monaco for her 1956 wedding, wearing a white hat that was only half the size of this one. 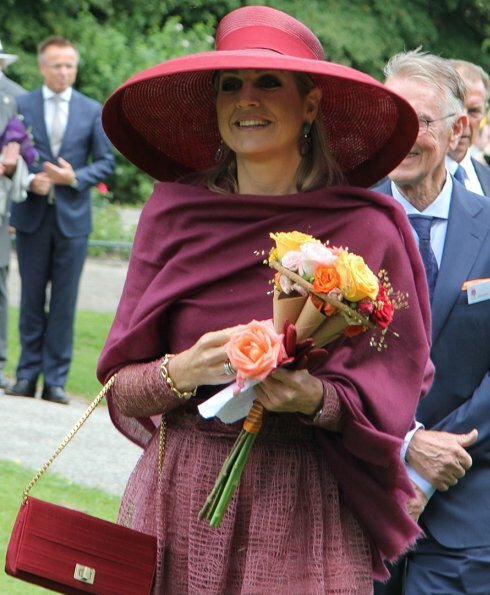 I think, only Maxima can wear those big- or eccentric hats with great smile! 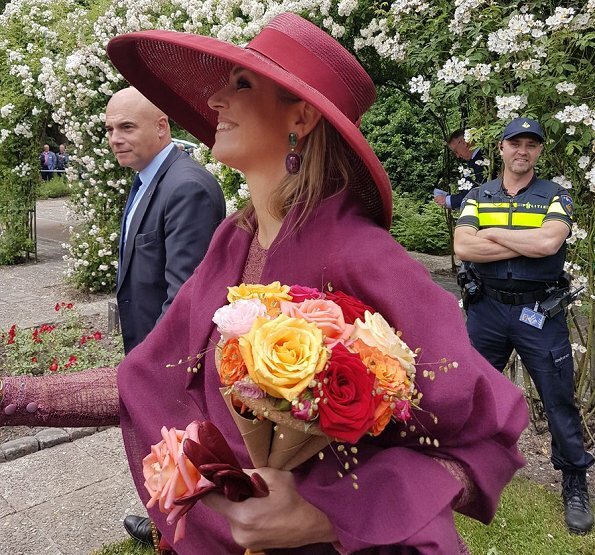 Imagine Letizia: she would really fly away with it, ha ha. Try and analyse the theme, One should never underestimate such beauty, she is her own person and lovely. Yet I find her exquisite, sadly cant understand the fineness of her hair. but all the same I adore her. She looks like ... Maxima. So glamorous and unconventional. Somehow she always makes me smile. 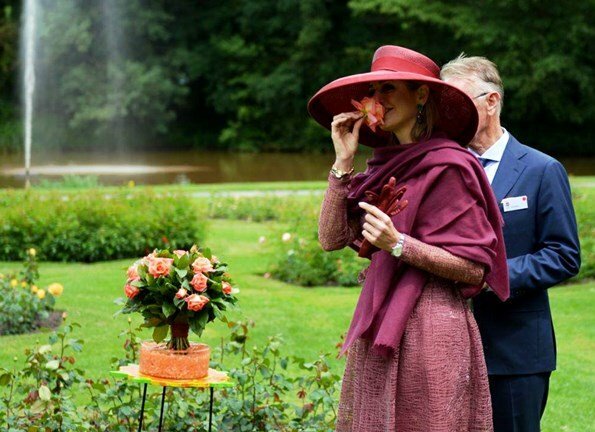 Even when her outfit/style looks quite outrageous (don't know anyone else who would look so wonderful with that umbrella hat). And such a wonderful colors and presence. Terrible dress, but I LOVE the hay! Terrible dress, but I LOVE the hat! I would really like this dress if the underskirt wasn't as short as it is, the fabric and the colour is lovely and the outer length is very elegant.